I have been dreading making a pie because every time I have made a pie crust it has never turned out right. With Thanksgiving quickly approaching I wanted to practice making a pie before I make a pie for Thanksgiving dinner. To date when I make pies they are always a crumb crust and it’s time for me to work on the things that intimidate me. 2. In a large bowl combine the flour and salt and quickly whisk. 3. Add butter and work together with your fingertips until mixture is crumbly. 4. Add in cold water little by little until dough comes together. 5. Divide dough in half and roll out on a lightly floured surface and transfer to pie dishes. 6. Poke the dough with a fork all over. 7. Fill pie shells with dried beans or pie weights and bake for 12 minutes. 8. Remove the beans or weights and reduce the temperature to 350°F. 9. One bake set aside and quickly put together the pie fillings. 1. In your first small bowl; mix ground cherries, cinnamon and golden brown sugar until ground cherries are coated. 2. In your second small bowl; mix rhubarb, ginger, ground ginger and sugar until rhubarb is coated. 3. Fill each pie and roll out the remaining dough. 4. 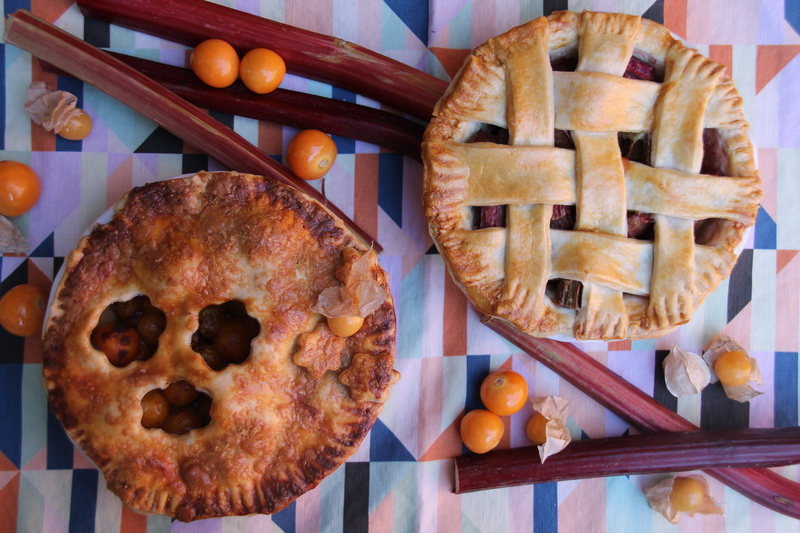 Decorate pie with cut outs and a lattice design if you want to get creative. Just ensure you crimped the edges with a fork to seal the two pieces of dough together. 5. Wash with the eggs wash and sprinkle the ground cherry pie with golden brown sugar. 6. Bake for 1 hr to & 1 & 30 hrs depending on your oven and how thick your crust is. (Ensure the bottom of your crust is golden brown to ensure it has baked through. •	Have fun decorating the pie crust if you can. It was one of the more enjoyable parts of baking the pie besides eating the filling. Ground Cherry & Physalis are also known as Golden berries, they all have the same cherry tomato look. Except the Farmer’s market variety were smaller as a whole and less sweet than the non-organic Golden berries from Colombia. Funny enough I actually enjoyed making this dough; because it actually turned out; which never happens for me. I even tried to decorate the pie because I was on such a high. The taste was not bad and I honoured these limited and very seasonal produce. I will have to avoid making pies with tops on them for now as the top was to0 thick and not flaky. This will probably be solved by rolling out the dough thinner; but for now open faced pies will continue to be my thing. I feel confident in making pasta now and I even pulled out my Ravioli stamper for sometime in the near future. Thanksgiving is this weekend and I was in the mood to do a little trial run for the big day. 2. Slice onions and place inside the cavity of the hen along with whole garlic. 3. Rub spices over hen and spread Dijon mustard over top. 4. Bake for 1 hour and until the skin is a golden brown. 5. Over high heat boil a pot of salted water with the gem potatoes. 6. When the potatoes are slightly tender drain; set aside and let cool. 7. Once cooled place potatoes on a cutting board and smash overtop with a mug base and sprinkle with fresh thyme. 8. In a medium size saucepan steam haricots until just firm. 9. Immediately place haricots in an ice bath to shock them and stop the cooking process. 10. Set aside in a bowl and add chives and mix. 11. Using a small frying pan, place a little extra virgin olive oil and sauté mushrooms. 12. Place of platters and serve. 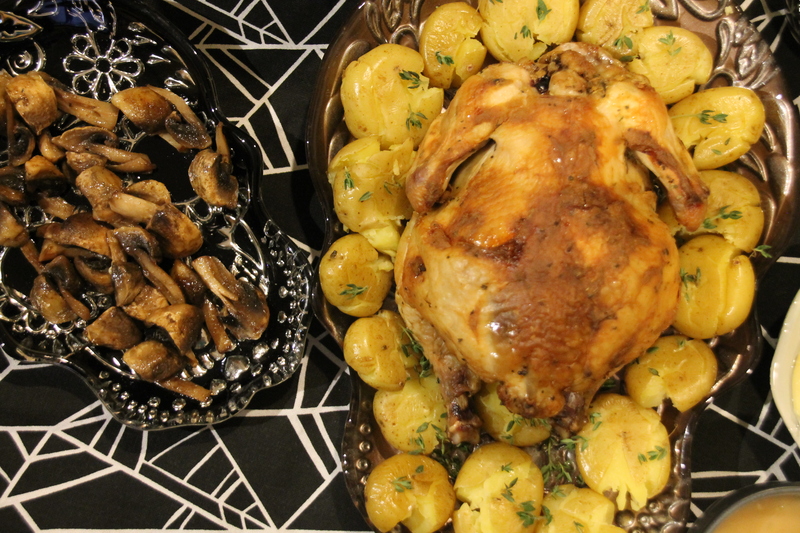 These little hens are such a simple, gourmet way to enjoy your Thanksgiving. If you are not in the mood for Turkey or have guests that dislike turkey; this is the way to go. One hen per person is a wonderful idea and also having an intimate dinner for two splitting the rock hen in half works just as well. This meal felt very farm to table with the Farmer’s market finds and a more unique protein. I have already bought another hen for a rainy day when I want to make something just a little more special for my guests. Is there such a thing as too savoury…I sure think so. I made this recipe well before Thanksgiving thinking this sounds like an amazing unique dish too bad you can really only stomach it around the holidays or at least only I can. 1. Fill a large pot with water and boil sweet potatoes until tender. 2. Using a large frying pan, fry bacon slices and place on a paper towel and let absorb. 3. Chop bacon (leave some bacon behind to decorate if desired) and place in a large bowl along with brown sugar, flour, walnuts, butter, cayenne pepper, black pepper, nutmeg, cloves, ginger, cinnamon, sea salt, rosemary, basil and combine with a whisk. 4. Preheat oven to 350°F. 5. Mash the sweet potatoes and add in the milk, eggs and sugar and spice mixture and stir until well incorporated. 6. 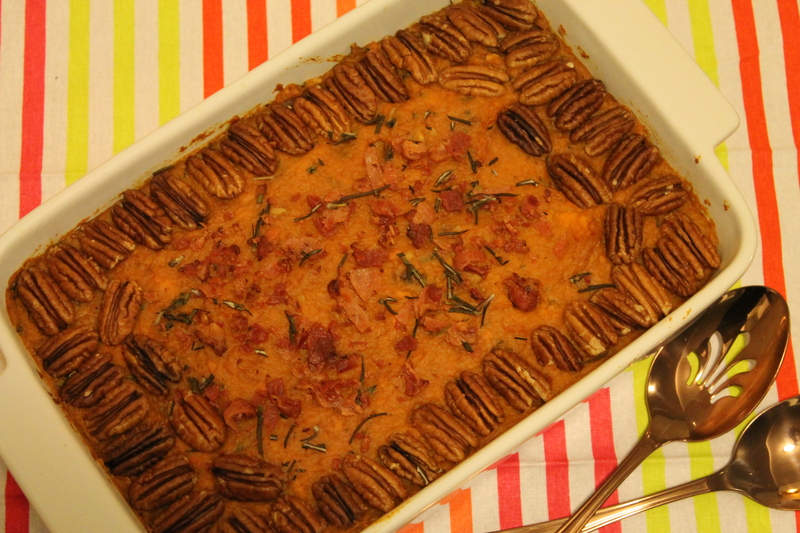 Pour sweet potato into a casserole dish and decorate with pecans along the sides and add bacon bits along with more rosemary in the centre. 7. Bake for 30 minutes and serve. Like eating a very savoury sweet potato pie; the crunch from the nuts and the touch of saltiness from the bacon had me wanting more, the spices though probably a tad too much had me running away and I have altered the recipe accordingly for next time. I’m more of a hint of spices not an overwhelming amount. For awhile I didn’t even remember there was cayenne pepper in it until the slow burn crept up and then that was it I’m was done. This recipe smelt amazing from beginning to end, yet after 5 or so bites I just thought I think this is too savoury. Much like Pumpkin Spice Lattes in autumn and fruit cake or eggnog at Christmas some things are better only eaten at certain times of the year; because you well just don’t enjoy it as much any other time of the year. There is this novelty factor in a way and this is why I’ll be making this for either one of these holidays for dinner and no other time in the year ever. It is funny how a recipe just evolves. This recipe started out as a recipe from a magazine and every year I would deduct and add and let’s face it this recipe probably hasn’t stopped evolving; but for right now it is a beautiful complex dessert that is attention grabbing for the eyes and with ever bit. 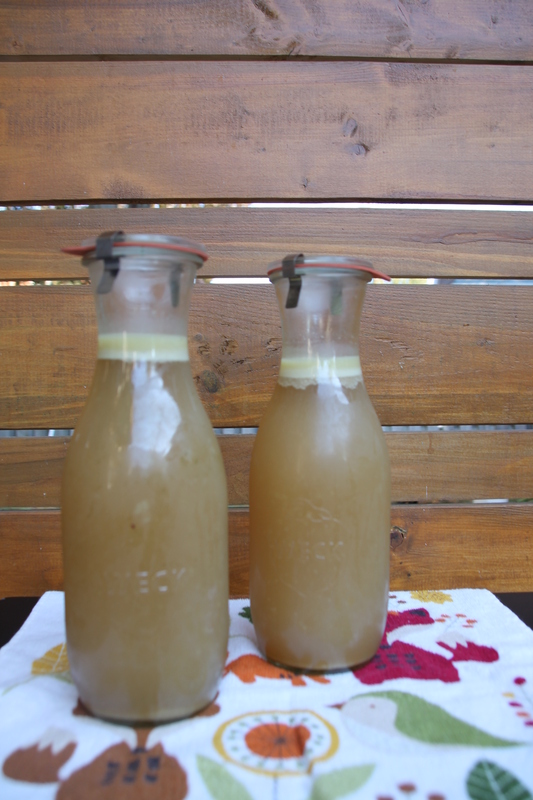 Prepping for Thanksgiving dinner with this ginger syrup recipe. Make this ahead of time and refrigerate. 1. Peel ginger and grate half and slice the other half. 2. In a medium sized pot bring ginger, sugar and water to a simmer over medium-low heat. 3. Stir frequently until sugar has dissolved and then lower to low heat and simmer for 30 minutes. 4. Using a sieve strain out the ginger pieces and pour into a container and let cool to room temperature and then refrigerate. •	Use the remaining ginger syrup, for cocktails, tea or anything else you like. This was a very simple recipe and I haven’t made too many types of syrup before; but this one turned out well. The syrup was spicy and tasted very much like ginger. I can’t wait to incorporate this into my Thanksgiving recipe. 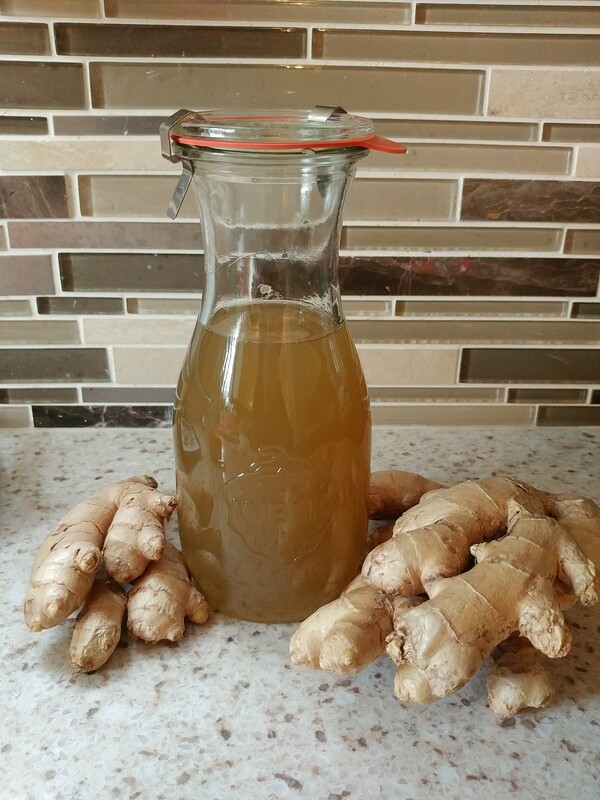 • Prepare ginger syrup recipe ahead of time. See recipe above. 1. Preheat oven to 350°F. Line a baking sheet with parchment paper. Have a 9” pie plate at the ready. 2. Stir chocolate crumbs with butter in a medium bowl until moist. Press crumbs into the bottom and up the sides of pie plate. Bake in centre of oven, covered with foil, for 10 min. 3. Whisk egg yolks in a large bowl. Add pumpkin, coconut milk, brown sugar, ginger syrup and spices. Whisk until mixture is smooth. Pour filling over warm crust. Smooth top. 4. Bake in centre of oven, covered with foil for 30 min. Remove foil and continue baking until filling slightly jiggly in the centre, about 20 more min. Transfer to rack to completely. 5. Toast desiccated coconut in a small non-stick frying pan until just browned and set aside. 6. Place pepitas around the outside of the pie followed by the coconut flakes. 6. Using a medium sized bowl and a hand held mixer. Combine ¾ cup granulated sugar and egg white along with ¼ tsp cream of tartar and mix on medium gradually increasing to high speed. Meringue is complete when it becomes stiff peaks. 7. 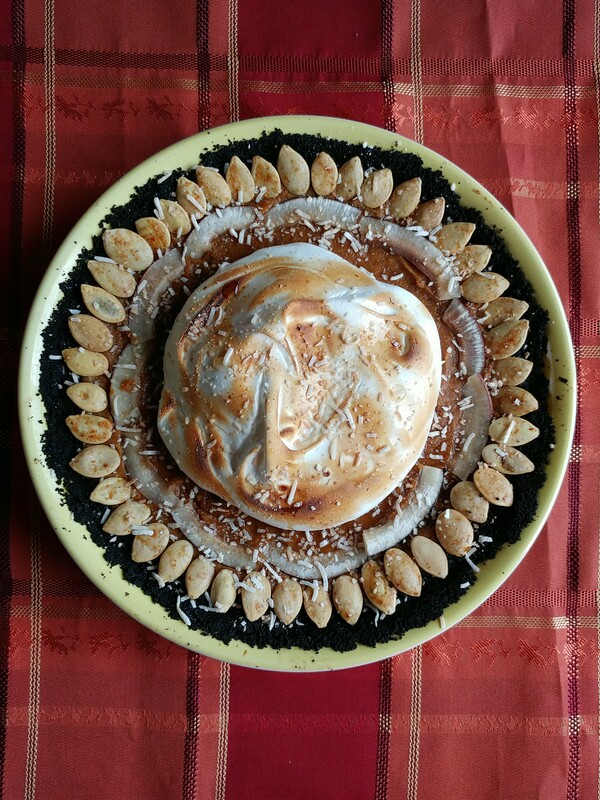 Spread meringue on pumpkin pie in the middle leaving a little bit of the pumpkin pie to show and using your kitchen torch; torch the meringue. 8. Garnish pie with toasted desiccated coconut and ginger syrup and serve. I just loved cutting into a pie and seeing all the layers and the giggle and nothing spilling over. It means I’ve done good and at Thanksgiving this is when your recipes need to be top notch. The flavours came together superbly and I think I won’t be changing my recipe anytime soon. Sometimes I wonder how vegetarians get through the holidays like, Thanksgiving, Christmas and Easter where the main focus is a big piece of protein. This is also the time where there probably is the most side dish options thank can build up a full meal, but still center stage is well let’s face it that protein. I saw this recipe in a Longos in-store magazine and altered it from being non-vegetarian to vegetarian. To me there is no reason why the sides can’t at least be all meat and animal by products free right. 1. Over medium-high heat melt butter in a saucepan. 2. Add in apples and onions and sauté for 8 to 10 minutes until golden. 3. Add in the cranberries, garlic, broth, maple syrup, cider vinegar, salt and pepper. 4. Bring mixture to a simmer until slightly thickened, 7 to 8 minutes. This is was a very delicious cranberry sauce. 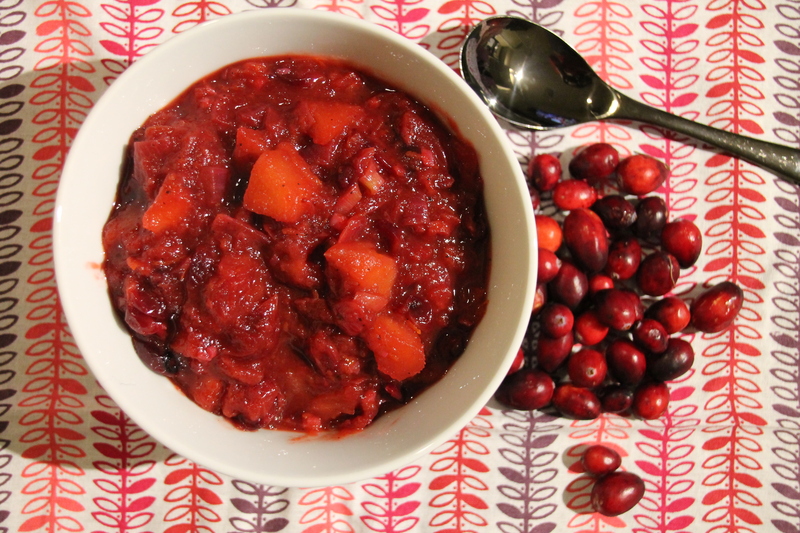 I found it to taste more savoury than the other cranberry sauces I have had around Thanksgiving and Christmas. 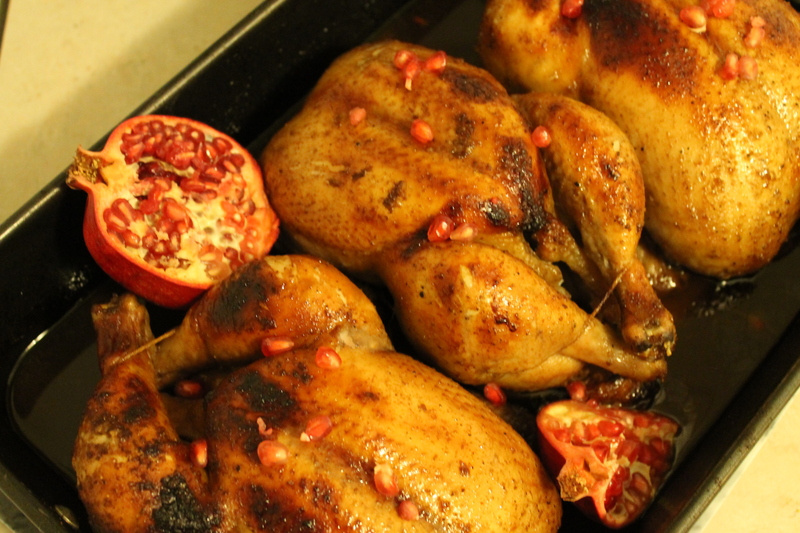 When I saw the pomegranate lacquered roast chicken I was thinking what I could make to accompany this as a side dish. Lucky for me Heather made some suggestions in her post and I chose to make potatoes. 2. Bring the cream to a simmer in a medium saucepan. 3. Using a large saucepan melt the butter and whisk in the flour and make a roux. 4. Cook for a few minutes over medium heat to let the flour taste dissipate. 5. Add the cream to the roux pot and whisk until the sauce is smooth. 6. Now add the cream cheese chunks and whisk until smooth. 7. Season this with nutmeg, kosher salt and pepper. 8. Pour the melted butter into a 9×13 baking dish and layer the potatoes. 9. Ladle a thin layer of the sauce over the potatoes and sprinkle with parmesan and mozzarella. 10. Add another layer of potatoes and repeat this process over until complete. (The top will have the most sauce, parmesan cheese, mozzarella along with thyme, basil and parsley. 11. Bake at 350°F for 1 hour or until the potatoes are tender and the top is golden brown. 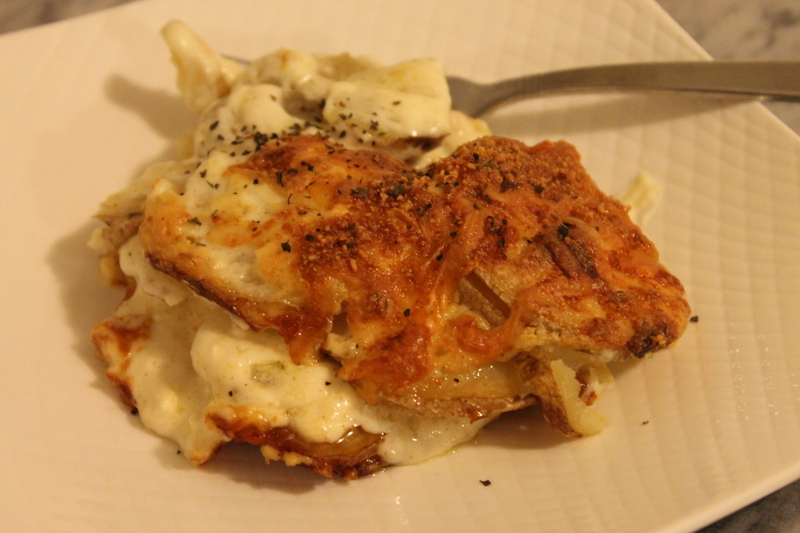 •	I lessened the cheese to 1/3 cup parmesan cheese and added 1 cup of mozzarella cheese. •	I also added basil and parsley to the top of the potatoes. •	Increase the temperature 350°F so the chicken and potatoes are in the oven at the same time. •	This is also a great dish to make a second container of and freeze. 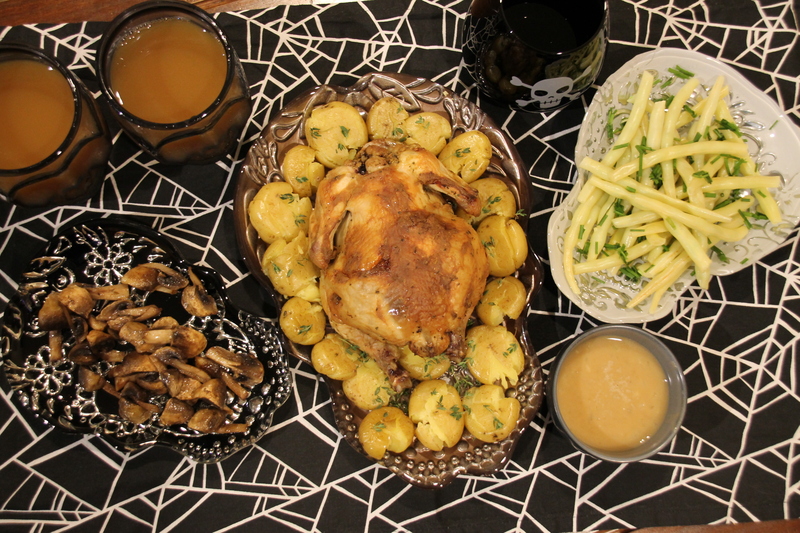 “So good I wanted more – the potatoes were roasted perfectly, falling off my fork as I went for bites. Yum Yum Yum is all I have to say. It was homey and a great comfort food. I am glad I altered the amount and type of cheese as I didn’t want to consume all that cheese. I can finally say I made a roux which was really easy to make. I love pomegranates and when they are in season I am enjoying them as much as possible. Yes it is a messy and hard to eat fruit and I’d advise not to eat it in your best clothes, but it is so worth it. There is tartness and sweetness that I love and I enjoy it whether I have the actual fruit or the juice. 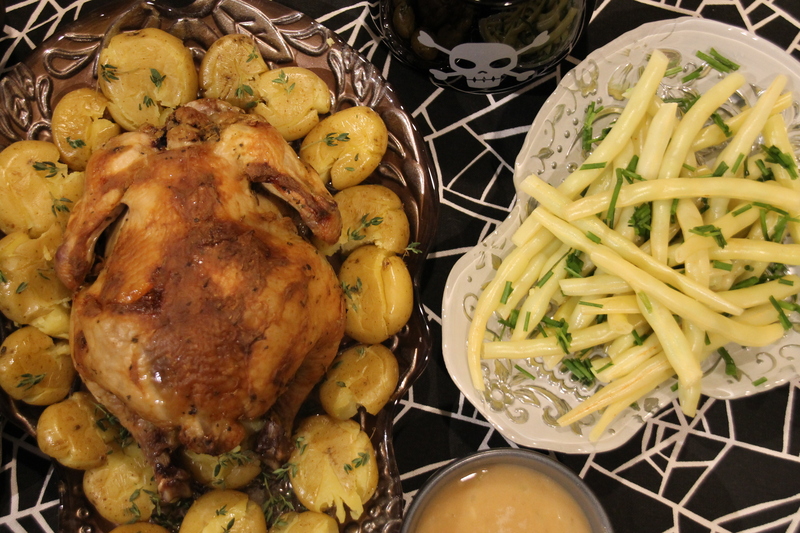 This recipe has been on my “to-do list” and now that the seasons are right I made a seasonally flavoured roast chicken. 2. Rinse the chicken in cold water and dry with a paper towel, and set in a baking pan. 3. Sprinkle with spices and rub onto chicken. 4. In a small saucepan melt butter and then add wine, pomegranate juice, sugar and simmer on medium-low heat for 20 minutes or until the liquid has reduced to half. 5. Pour the liquid over the chicken and place on the middle rack in the oven. 6. Roast the chicken for 1 hour 35 minutes, basting every 20 minutes with the pans juices. 7. Let chicken rest for 10 minutes and serve. •	Sprinkle with some pomegranate seeds and serve. •	Invest in a turkey baster. I have made a few turkeys now and I still don’t own a baster. It’s time I get myself one I think. •	The pomegranate sauce did reduce by half but I still found it to be very liquidy. The roast didn’t end up having a pomegranate stained lacquered look that the picture had at all. Next time I would make myself a pomegranate jam the day before and then brush on the jam, and use that along with the pomegranate reduction in the recipe above. •	I added more spices to the chicken (season salt, black pepper, paprika, and onion and garlic powder). •	Use the drippings for a gravy. •	This is a great recipe to make more than one roast of. 3 roast chickens fit into my baking pan perfectly and I used the same amounts in the recipes and it came out delicious. I made one for dinner, one to freeze and one for my dad. •	Serve with au gratin potatoes along with steamed green beans and carrots. I am gushing about this roast chicken. It was juicy, sweet and tart and it is basically fool proof besides the pomegranate lacquered part and the need for the skin to be more crispy. This would also be a good alternate to a thanksgiving turkey for those who don’t like turkey. The drippings and the pomegranate sauce made a tasty gravy. I spent Sunday morning waiting for the LCBO to open. I don’t drink except for the occasional cocktail so when I went to the LCBO at 10:30am and realized it wasn’t open yet I knew I wasn’t a regular there. I came back at 11:50am for the noon opening to find a line up of 15–20 people I kid you not and I just chuckled to myself and thought “These people are serious”. I was waiting for the pumpkin cooking club challenge to come, since Canadian Thanksgiving is on October 14th 2013, it was inevitable I thought. So I had my pure pumpkin puree on hand already when the challenge was posted. When I saw the recipe for the Ultimate Pumpkin Loaf, I decided to get creative and put my Candy Coated Culinista twist on it. 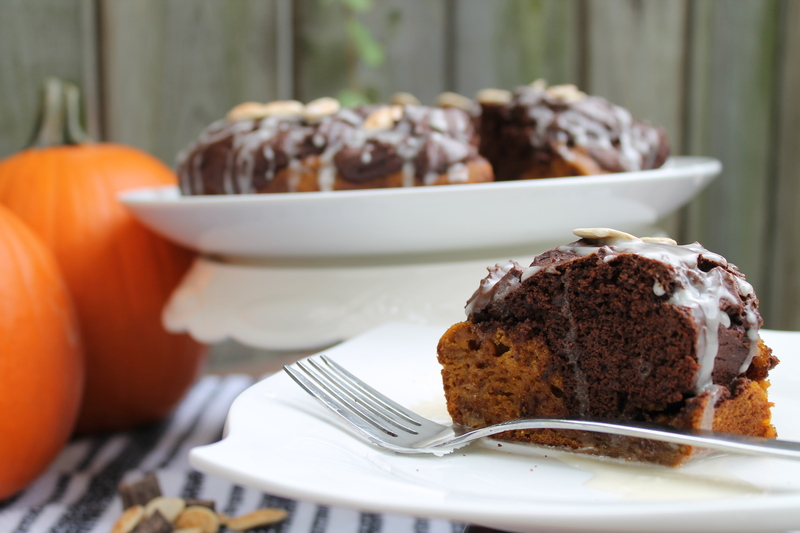 I’ve been thinking about how I can get people to like pumpkin more in desserts more. I seem to find pumpkins get a bad rap; you either love or hate it. I am on the fence though, with me it all depends on how it is presented to me. Yes they are the quintessential fall squash, but they seem to be in one of two places in pumpkin pie or on the porch and butchered up for Halloween with a light shining from within. So this challenge gave me the chance to experiment and let me say it was touch and go for a bit there, as I was looking through the oven window praying this thing rises. Click here to see my picture on the cooking club gallery page. 1. Preheat over to 350°F. Lightly spray the Bundt pan with cooking spray. 2. Stir flour with baking soda, spices and salt in a medium bowl. 3. Whisk eggs with brown sugar in a large bowl, and add in flour mixture. 4. Pour semisweet chocolate into a microwave safe bowl and add 1 tsp of oil and cook until all the chocolate is melted. Check the chocolate at 30 seconds intervals to ensure it doesn’t burn, and stir each time. 5. Split mixture in half and add half to the electric mixer. 6. 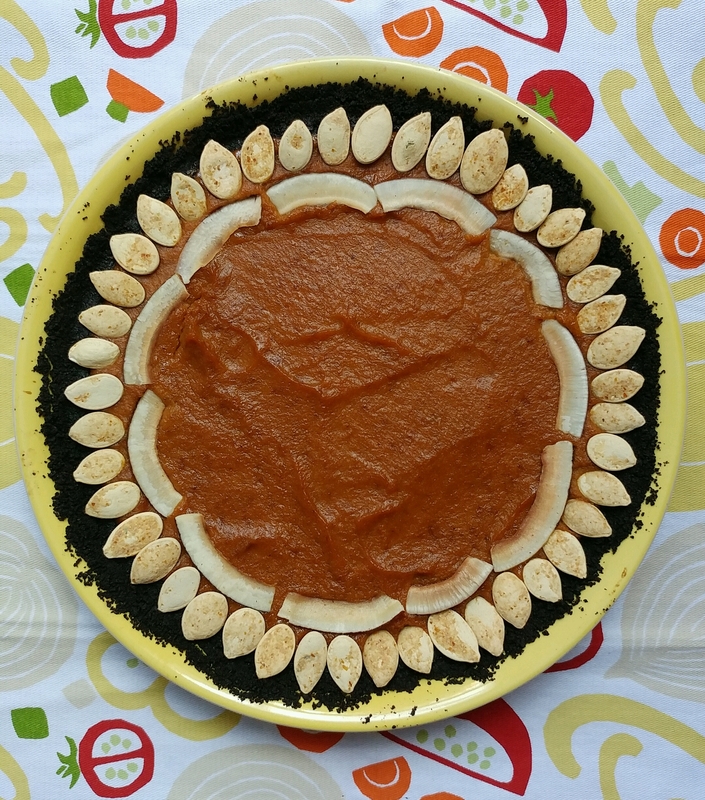 Pour in pumpkin puree, 1/3 cup ale, 1/3 sunflower oil & 1tsp vanilla into the electric mixer and whisk until combined. 7. With the remaining half of the mixture pour into a clean mixer bowl and add chocolate, oil, ale and vanilla. 8. Pour the pumpkin mixture into the prepared pan, followed by the chocolate mixture and smooth the top. 9. Bake in the centre of oven until it is dark golden and a skewer inserted in the centre comes out clean. 10. Let cool for 15 min and then run a silicone knife spatula along the edges transfer to rack to cool. •	Pumpkin ale is sold I beer or liquor stores during the fall; but cream ale works just as well. •	Since its fall I found Pumpkin seeds at Metro on a random trip to the market and saved myself the trip to a Latin grocery store. They were much bigger seeds and super spicy and salty, but you only get a few seeds with each slice so it didn’t alter the flavour in any way. They were all gone by 8:30am at Mr. C’s office and that made me smile. But two said they aren’t fans of pumpkin, they really enjoyed the chocolate but they didn’t care for the pumpkin. more recipes to come. I am planning to make a cranberry molasses cake and an apple caramel trifle and I can’t wait. Yesterday I made another Bundt for Thanksgiving at the in-laws and I used water instead of Pumpkin Ale in step 6. I also used swirled milk & white chocolate chips instead of semi-sweet chocolate chunks in step 7. Please use the same measurements. Mr. C. said this tasted better than the first batch. I served it with freshly whipped vanilla whipped cream. 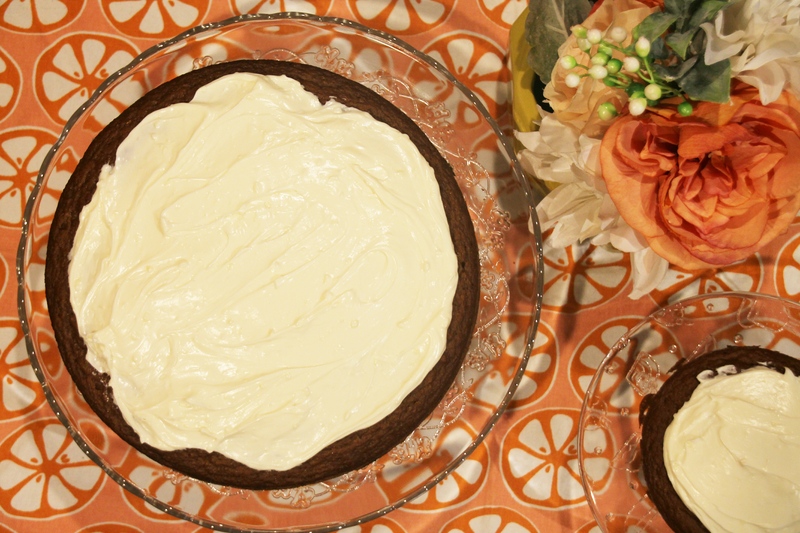 Everyone at the Thanksgiving dinner enjoyed it and loved the combination of pumpkin & chocolate.